Dual relationships (Zur, 2014) refer to situations where two or more connections exist between a therapist and a client. Examples of dual relationships are when a client is also a student, friend, employee or business associate of the therapist. Zur defines many types of dual relationships, including social, professional, business, communal, institutional, forensic, supervisory, sexual, and digital, online, or internet dual relationships. 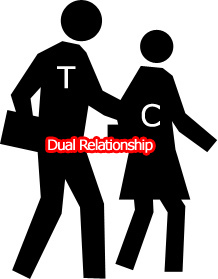 While all dual relationships involve boundary crossing, exploitive dual relationships are boundary violations. Multiple relationships are situations in which a therapist is engaged in “one or more additional relationships with a client in addition to the treatment relationship. Multiple relationships may be sexual or nonsexual. Nonsexual multiple relationships may include social, familial, business or financial relationships, and possibly others. Multiple relationships are distinguished from incidental contacts. Incidental contacts are situations in which the psychologist and client have an interaction in another setting that is unplanned and very brief. Examples may include noticing that the psychologist and client are attending the same concert or community event, being members of the same organization, or briefly crossing paths in the community” (Barnett, 2014). For many psychologists practicing in rural and small communities, dual relationships are everyday occurrences. The person who bags groceries in the supermarket, pumps gas, works in a dentist’s office or chaperones children on school field trips may often also be the therapist’s client. Unavoidable dual relationships are also the norm within numerous small populations in larger metropolitan areas, such as gay/lesbian, handicapped, various minorities, religious congregations and other such distinct small societies. In fact, duality, mutual dependence and prior knowledge of each other are prerequisites for the development of trust and respect in these communities. • Exceeding areas of competence, reluctance or unwillingness to refer for other types of therapy, assessment, etc. Marriage and family therapists are aware of their influential positions with respect to clients, and they avoid exploiting the trust and dependency of such persons. Therapists, therefore, make every effort to avoid conditions and multiple relationships with clients that could impair professional judgment or increase the risk of exploitation. Such relationships include, but are not limited to, business or close personal relationships with a client or the client’s immediate family. When the risk of impairment or exploitation exists due to conditions or multiple roles, therapists take appropriate precautions. Social workers should not engage in dual or multiple relationships with clients or former clients in which there is a risk of exploitation or potential harm to the client. In instances when dual or multiple relationships are unavoidable, social workers should take steps to protect clients and are responsible for setting clear, appropriate, and culturally sensitive boundaries. In summary, it seems clear that multiple relationships are of interest in the ethics codes of most major professional organizations. Are they innately hazardous for client and therapist? Not necessarily. Are they cause for ethical alertness and introspection? Yes. This entry was posted in Counseling CE, Marriage & Family Therapy CE, Mental Health, Psychology CE, Social Work CE and tagged CE, CE Broker, CEUs, continuing education, dual relationships, Ethics & Boundaries in Psychotherapy, Florida, License Renewal, multiple relationships, Online Courses, Professional Development Resources by Gina Gunderson. Bookmark the permalink.